Sweet Potatoes or "Yams" are rich in essential vitamins and minerals, and Certified Heart Healthy by the American Heart Association. Source: National Agricultural Library (NAL), part of the Agricultural Research Service of the US Department of Agriculture. The sweet potato is a complex carbohydrate that provides twice the recommended daily allowance of vitamin A and more than one-third of the requirements for vitamin C. They are a substantial source of dietary fiber, especially when eaten with the skin. There is more fiber in one sweet potato than in a bowl of oatmeal. 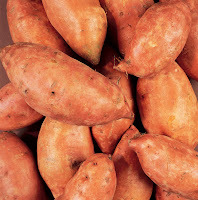 The sweet potato is also an important source of vitamin B6, iron, potassium and fiber. Sweet potatoes contain virtually no fat and are low in sodium.